After Google, Facebook is the most viewed website, and since the clear majority of the world’s population use it – making it one of the largest reserves of data kept on people – it has a leading edge on monitoring people whenever it wants, as it has access to all of your information at the drop of a hat. Which brings us to the question: What does Facebook really know about you? To answer, there is an extension that can give you an analysis on your information that Facebook stores on its servers. This new plug-in was developed by ProPublica, a non-profit organization. They call their invention the What Facebook Thinks You Like. As per the organization, their intentions of developing this plug-in were to expose the amounts of data Facebook continues to keep on its users. 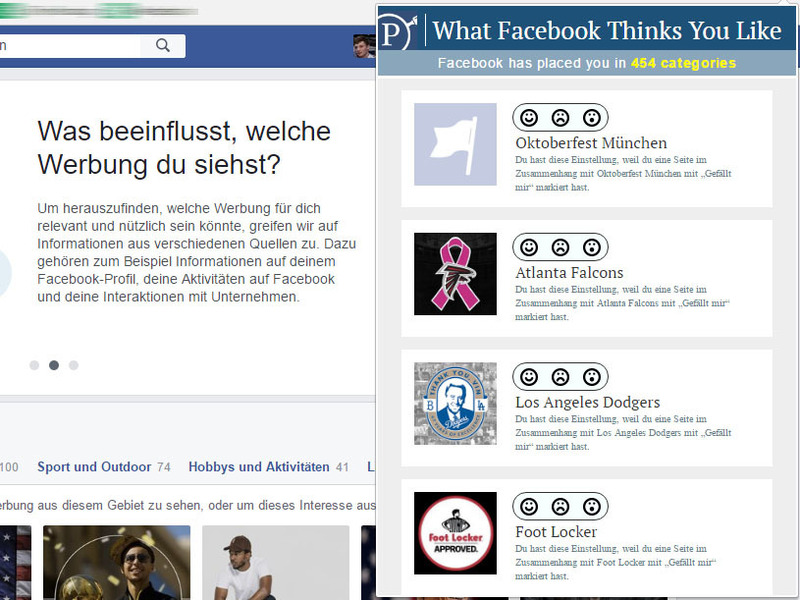 Image Source: Google Image – A screenshot of ProPublica’s browser extension called What Facebook Thinks You Like, showing the results after clicking on it. The Menlo Park-based company has more than 1.15 billion active users and the number is growing on a yearly basis. Once we register ourselves on their platform, we agree to their terms, which in essence allows them to do whatever they want with our data; and not to mock only Facebook, but most other social media companies do this. It is fair to say, compared to 15 years ago, we no longer pay attention to our privacy. Where we were once hesitant to give away our address or phone number to someone, most no longer think twice in submitting this personal information into cyberspace. Furthermore, Facebook, along with other social media websites, not only collects our data to provide our elected governments with information, but it also uses the data to charge exorbitant prices to companies wanting to use their platform for marketing purposes. According to ProPublica, Facebook not only extracts and stores the information from our profiles, but it also buys information from different companies, such as our shopping behavior as well as our financial information. This information led ProPublica to design and create the browser plug-in that extracts some of the information that Facebook keeps on you, and as a request, ProPublica would like users to install the extensions and tell the company if the information their extension is giving them, is genuine. As a side note, the company will not share this information with anyone. Moreover, there is a reason to believe in their statement, as the company has won several prizes for its investigative journalism and research. The company also says that the information will also help them analyze Facebook’s data mining techniques. You can download the extension by clicking here. This article (What Information Does Facebook Keep on You? This New Extension Will Tell You) is a free and open source. You have permission to republish this article under a Creative Commons license with attribution to the author and AnonHQ.com.